You could say W22 Hotel by Burasari is in the heart of the action! This is where Bangkok comes to “Eat, Pray, Love”! 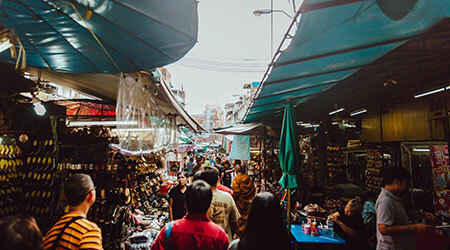 W22 is located on Wongwian, a classic Bangkok-style roundabout surrounded by old world shophouses, tea stalls and up-and-coming restaurants and shops. Wongwian sits between Yaowarat and Chareon Krung, two of Chinatown’s main boulevards, where everyday life unfolds. Yaowarat Road is chock full of century-old gold shops, traditional Chinese medicine apothecaries, tea stalls with rare leaves from China and Thailand, old world restaurants, grocers and drink stands. Every evening, Yaowarat hosts one of Bangkok’s liveliest street food markets, full of Thai-Chinese specialties that you cannot get anywhere else. Bangkok Chinatown offers an intriguing look at the city’s architectural legacy. Classic Chinese temples sit alongside Thai-Chinese shophouses and buildings with remnants of Sino-Portuguese and Art Deco architecture. W22 by Burasari is located within walking distance to Soi Nana, the epicenter of Bangkok’s hip bar, restaurant and nightlife scene. Gin aficionados will love the local gin menu at Teens of Thailand and Asia Today, while vintage-lovers will enjoy traditional Thai ya-dong spirits at Tep Bar. Soi Nana is an extension of Bangkok’s Creative District, a burgeoning movement of young artists, designers, chefs and mixologists who launched creative ventures in old shophouses up and down the Chareon Krung corridor. Yaowarat Road, a quick stroll away, features Bangkok’s best street food market. Favored by both locals and tourists, the scene here is vibrant and energetic as old-school street hawkers serve up exotic Thai-Chinese delicacies and vintage recipes passed on through the generations. 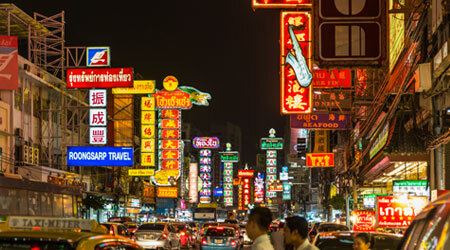 Bangkok Chinatown is famous for its gold shops and wholesale markets, teeming with clothes, shoes, accessories, foodstuff, toys and anything else you can imagine. Stroll through Sampheng and Phahurat and pick up textiles accessories and souvenirs at a bargain. 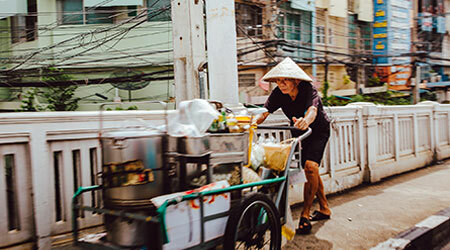 Meander the side streets and back alleys, and discover old fresh markets and guilds of artisans making typical Chinese style desserts and moon cakes, joss paper and incense. And, neighborhood pop-up flea markets and “thieves markets” are perfect for finding rare antiques and one-of-a-kind relics.